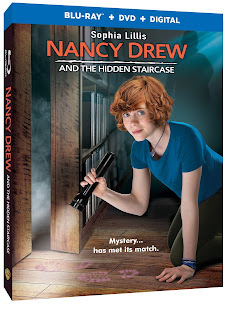 Home » Expired Contests » Enter to Win Nancy Drew And The Hidden Staircase on Blu-ray! Enter to Win Nancy Drew And The Hidden Staircase on Blu-ray! **“Warner Bros. Home Entertainment provided me with a free copy of the Blu-ray I reviewed in this Blog Post. The opinions I share are my own.”** Based on the Bestselling Book! The iconic mystery solving teenager from the classic Nancy Drew books is back with an all-new feature length film that will keep you guessing until the very end! Warner Bros. Home Entertainment will release Nancy Drew And The Hidden Staircase on Digital starting March 26, 2019 and Blu-ray™ Combo Pack & DVD on April 2, 2019. After the death of his wife, Carson Drew decides to leave Chicago behind and make a fresh start with his daughter in River Heights. But for 16-year-old Nancy Drew, life in a small town is mighty dull. She longs for excitement, adventure, and the chance to make a difference. Nancy gets that opportunity when she is asked to help solve the ghostly activity at the Twin Elms mansion. Can she help explain the creaking footsteps, exploding lightbulbs and the ominous creature? Is it the handiwork of high-school bully Derek Barnes? Or is it possible that the ghost of original owner Malcolm Colfax is back for revenge? Recruiting her best friends George and Bess, along with local “mean girl” Helen, Nancy Drew is on the case! The more you comment on the better the odds. Comment DONE below when finished. No Purchase Necessary. Only one entry per mailing address per giveaway. The prize will be sent via FedEx or UPS. No P.O. Boxes please. This contest is from Mind on Movies and its affiliates. The entries will be checked.